R is a zombie that doesn’t remember his real name, how he died, or even how the zombie apocalypse began. He lives in an abandoned airplane and wanders an airport filled with fellow zombies on a daily basis. However, he is different from the other zombies–he doesn’t enjoy eating people, even though he knows it’s a necessity. He also dreams about having a better life, one filled with more than just riding the escalators day after day. When he eats a boy named Perry’s brain and receives his memories, he feels the love that Perry had for a girl named Julie. When R realizes Julie is about to be eaten also, he decides to protect her. As he begins to get to know her and develops feelings for her, he realizes that he is changing and becoming more human. I was really excited to read this one because, aside from the fact that I love anything involving zombies, I had seen the film trailer for Warm Bodies and loved the thought of a story told from the zombie’s perspective. I am a stickler for reading the book before seeing the film, so I got myself a copy of the book ASAP. I loved how R is such an honest character–he tells it like it is and I enjoyed seeing the world through his eyes. Some parts of this book were absolutely hysterical, yet other parts were very heartfelt. I loved seeing R relearn how to speak and read and basically be human again. The writing style was very impressive, and the story itself questions today’s world and what we are doing to it. So, as soon as I read the book I knew that I had to see the movie. Nicholas Hoult did a fantastic job as R–he really embodied R’s innocent and honest nature. Teresa Palmer was also excellent as Julie, however, film Julie was slightly less troubled and rough around the edges than book Julie. I felt that knowing more of Julie’s background in the book helped me understand her character a lot better, and in the movie she was slightly more one dimensional. Julie’s father was definitely more toned down in the movie, and we didn’t get as much of his background and the history of his relationship with his daughter as we did in the book. The movie also didn’t have as much of Perry’s memories as the book did, but I expect this was just a consequence of time constraints in films. Overall, Warm Bodies was a beautifully written book that bridges genres, and its film adaptation was funny, entertaining and relatively true to the book. I enjoyed the book and film immensely, and highly recommend both! 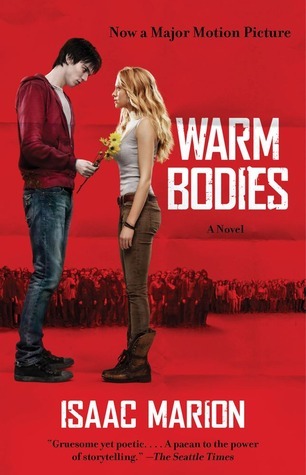 Warm Bodies was released October 14, 2010 and while it would be great as a standalone novel, it is actually the first in a series. The second book in the series is currently untitled and is expected to be released in 2014.